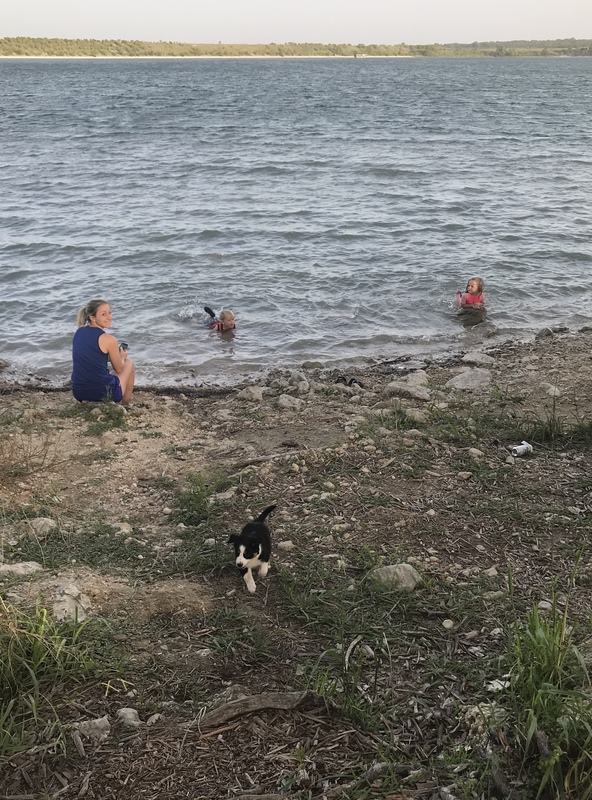 Took some time early Sunday evening to enjoy Boerne Lake with the family for a quick swim to cool off on the summer heat and pizza picnic dinner. We grabbed a quick pizza from local Boerne pizzeria Z's pizza around 7PM and headed for Boerne lake. We arrived with a good amount of people still enjoying the lake from the day but not too many that we couldn’t find a spot with a picnic table for myself, wife, two kids and our Border Collie puppy Bonnie...plus we were able to get a parking spot right up front. If you have ever been to Boerne Lake you know there is plenty of shade to be had under all the big trees along the lake. We found a nice spot where the kids could put their feet in and swim where it was still shallow enough that they could stand up when wanted to. The water was nice and cool! If ever looking for something to do outdoors in North San Antonio or Boerne Area definitely recommend checking out Boerne Lake and it’s just a few minutes off IH-10. Right now the park is open from 5AM to 10PM most days.